Automatic Continuous Sealing Machine is used to seal small bag and it applys electronic constant temperature controlling system and stepless speed regulation. It can seal plastic films of various materials. 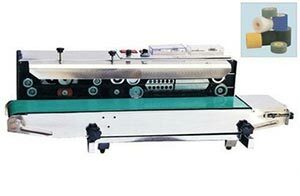 This machine adopts steel-roller coding device or ink-roller coding, which can print the desired date simultaneously with sealing. With the characters clear and conspicuous, the colors are selectable, not easy to erase and changeless. Coding is instant printing and instant dry.